All transactions are safe and secure with a reliable history in online purchasing behind each of our associates. 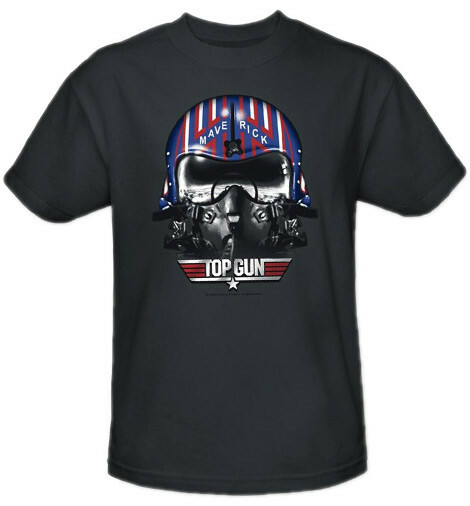 Buy the Top Gun Maverick Helmet t-shirt to own Top Gun clothing and merchandise. This Top Gun helmet tee will have you uttering Maverick's movie quotes in no time. The fronts of these heather grey Top Gun t-shirts feature an image of Maverick's helmet. It'll have you saying the Top Gun movie quote, "Too close for missiles. I'm switching to guns," and other memorable lines. Pick up a Top Gun hat from below to help make this outfit complete. Goose helmet tees are also available. Get one for your favorite wingman. In addition to the Top Gun Maverick Helmet tee above, browse the Top Gun Clothing Gallery for more apparel like men's and women's clothes, kids shirts or hoodies.